The term “independent film” is not a clear-cut designation necessarily reflective of any real relationship to mainstream avenues of funding or production. If it were, The Room would be the standard-bearer of independent cinema. Whereas something like Pulp Fiction — financed by Miramax (after their acquisition by Disney) — would be nowhere in the equation. But such categories are as much about style and artistic ambition as the likely rather untidy facts about from whence the money for a project might have originated. Independent of what exactly? Like most things, it’s fuzzy. What does this have to do with this here film, Madhumati? We’re glad you asked. For, while it might come as a surprise to some that any cinema exists in India outside the typical song-and-dance RomCom or weepy drama Bollywood formula, such a cinema is indeed present. 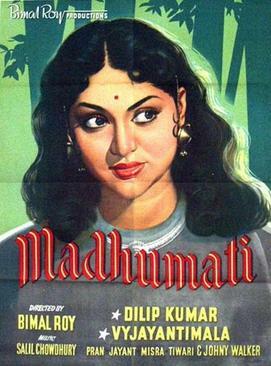 The term of choice there is “parallel cinema.” And Madhumati director Bimal Roy was one of its originators. Inspired by Italian neorealist films, Roy and his contemporaries sought to depict the social and political reality in India at the time rather than conjuring up images of escapism as was (and remains) the norm. But this too gets fuzzy. Because Madhumati, though generally regarded as an artistic masterpiece, is also in many ways Roy’s “sellout” film. It’s a love story. It’s got the whole song-and-dance thing. It’s not rendered realistically but rather in a gauzy noir style. And reincarnation — like all great Bollywood films, it involves reincarnation as a plot device. Indeed, some consider it pretty much the template for reincarnation films. That all being said, one probably wouldn’t mistake this for a typical Bollywood film. The ambitions are different. Ultimately, whether or not it is sufficiently “parallel” is of little concern. Expecting creative works to pass some sort of purity test says far more about the viewer than the work — and is certainly a ridiculous expectation within the realm of Indian cinema: the pleasure is often in the collision of multiple ideas, influences, and ambitions. Old and new. East and West. Serious and absurd. And, here, high and (supposedly) low.